You've been bombarded with a lot of information over the past year about a lot of issues, a lot of which really are not that important to the vast majorities of people living in America today when it all comes down to it. Politics tends to default to the lowest common denominator in terms of highlighting issues that prey on people's emotions to get them to vote for one side or the other on Election Day. You see it all the time from all sides of the political spectrum and that has been the case in American politics since Jefferson and Hamilton and Adams were hammering each other. Social Security is not one of those lowest common denominator issues. It is probably one of only 2 federal programs (Medicare being the other) everyone in this country either pays directly into (in the form of payroll taxes) and/or benefits from financially if you live long enough to participate in either program in retirement. Therefore, you need to know all you can about the facts and figures of Social Security as well as all the 'myths' that surround the program mainly because of its massive size and complications. The Committee for Fiscal Responsibility has produced this comprehensive document, 'Nine Social Security Myths You Shouldn't Believe' which should provide you with as much information as you could ever want to consume to be knowledgeable about the current state of Social Security so you can converse with your friends and colleagues and hopefully edify and educate them as well. Myth #1: We don’t need to worry about Social Security for many years. 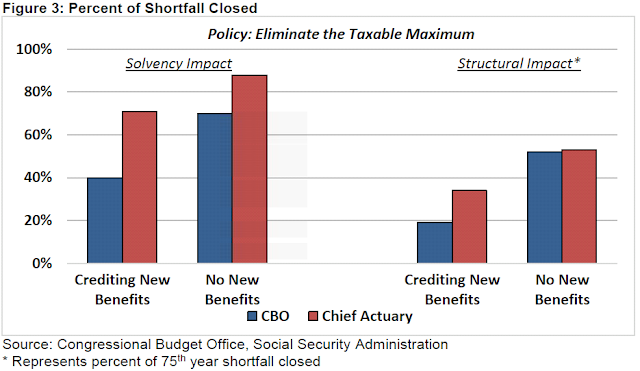 Myth #2: Social Security faces only a small funding shortfall. Myth #3: Social Security solvency can be achieved solely by making the rich pay the same as everyone else. 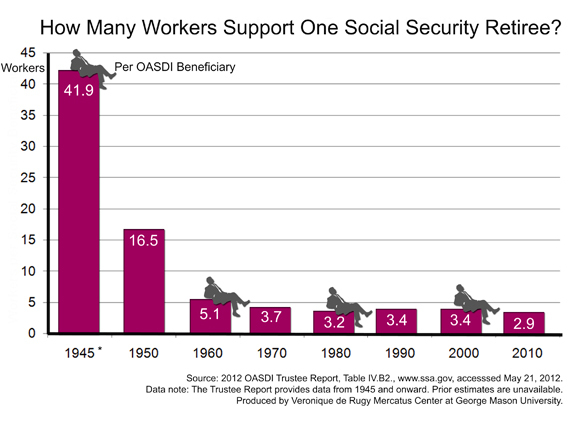 Myth #4: Today’s workers will not receive Social Security benefits. Myth #6: Social Security cannot run a deficit. Myth #8: Social Security can be saved by ending waste, fraud, and abuse. Myth #9: Raising the retirement age hits low-income seniors the hardest. We won't go into much detail here other than to show you the key charts and graphs below that highlight the refutation of the myths mentioned above. Hopefully, these charts will either interest or alarm you enough to force you to read the entirety of the 10-page CFRB report so you will become fully versed in the gravity of the situation now facing us in Social Security 'insolvency' or at least 'severe shortfall'. Social Security is legally barred from going into debt; in other words, it cannot spend more than it takes in (or has transferred in) over the life of the program. However, the program can (and does) run annual deficits. In 2016, for example, Social Security will run a cashflow deficit of about $70 billion. Over the next decade, the Trustees project cash-flow deficits of $1.5 trillion, and CBO projects deficits of $2.2 trillion.7 Even including interest income, the program is projected to begin running deficits by 2018 or 2020. 2018 or 2020. That is right around the corner, ladies and gentlemen! Have you heard even a peep out of our Chief Executive, President Barack Obama about this looming crisis? Nope. Not a word. Everyone 'presumes' that since Social Security is funded by its own separate payroll tax, that it is always going to be funded solely by those revenues. 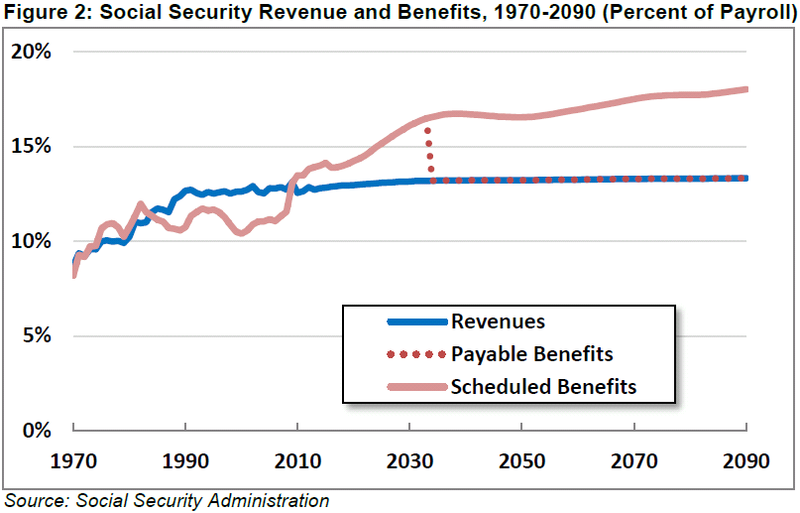 What is happening now is that Social Security essentially is dipping into the same general pot of revenue the government receives every day from taxpayers that has been used to pay for defense, homeland security, transportation and environmental protection programs. What most people do not realize is that that same general revenue pot of money is currently ALSO funding close to 85% of the entire Medicare budget in the country and 100% of all the Medicaid budget funded by the federal government nationwide. What happens when Social Security, Medicare, Medicaid and interest on the national debt consume 100% of federal tax revenues paid into the US Treasury each year and the majority of SS funding comes from general tax revenue, not just the dedicated payroll tax? Nothing else will get funded unless we borrow THE ENTIRETY of our defense, transportation, homeland security, welfare, environmental protection, foreign aid, science and tech, housing and education budgets from overseas sources. If you are a young working person out there today, you can be enamored all you want by the promises of Bernie Sanders or Hillary Clinton but just realize that nothing he/she promises you is likely to ever happen under him or her or any other President to follow in your lifetime. The cash shortfalls in Social Security pretty much insure that the days of an expanding welfare state in America are over and done with. Unless dramatic changes are made to all of our entitlement programs under the next President and Congress that is. The 2017-2018 115th Congressional session could be the most impactful session of Congress in your young lifetimes. You better hope the right people get elected for your future.